Hello new players, welcome to FRG! 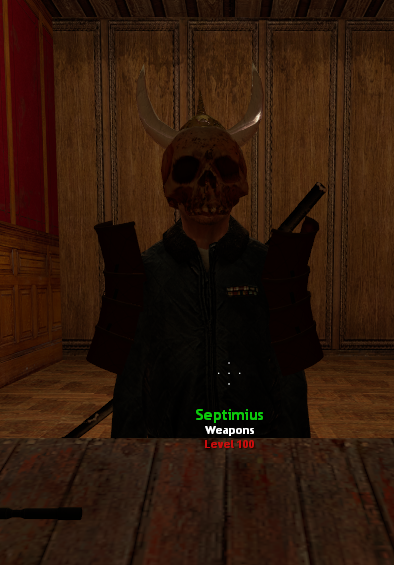 You've stumbled on to a unique, non-vanilla TTT server on gmod that runs off its own unique "inventory system". This means, within TTT, there will also be a sort of server-market with unique guns all displaying different stats and abilities. You will be able to collect your own guns here, each of which runs on rarities, and become rich. Don't worry though, every gun here is carefully balanced, so you won't get overpowered by players who have already begun collecting. Here, you'll also enjoy a variety of additions such as minigames, leveling, a lobby, and lots more. Our community is friendly and helpful, so if you have any questions not found on here, feel free to just ask. If you're looking for something specific, I encourage you use CTRL + F and search for keywords. The first question commonly asked by new players is, "Where are all the guns on this map?" A majority of FRG's maps lack the same quantity of guns lying around on the floor because each new player spawns with their own starter guns. You can hit "i" to view these guns. If you don't have them, you can either right click the top left of the menu where it says "Inventory" and click "Reload inventory", or you may have to leave the server and rejoin it. 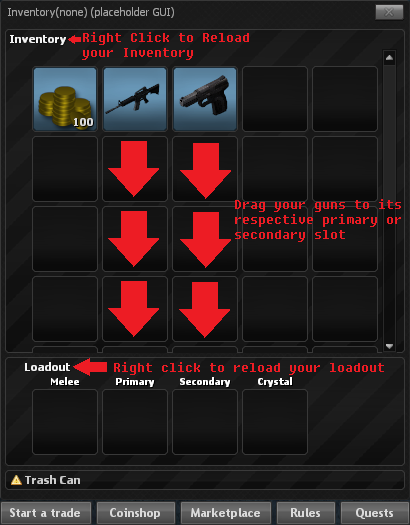 After your guns have properly appeared, you'll want to drag them into the "Loadout" section of your inventory. They will spawn with you every round after that point. If you change your loadout after you spawn and decide you would like different guns, you can right click where it says "loadout" and click "Re-Equip Loadout". This can only be done during the "Preparing" stage of the round, or within a couple of seconds into the round. You will NOT immediately have a melee or coins when you join the game. Your inventory saves, so you can leave and still keep all your obtained items. Be very cautious when trading. Although it's not allowed, some players will try to "shark" new players, especially if you get lucky with a good drop right away. Know your prices and confirm with trusted members of the community (usually labelled "Member" or above in the tab menu) to make sure you're getting a good deal. If you feel you have gotten scammed, please report it to a Moderator or Administrator. They will help you as much as possible. All trades are logged and can be looked at. Credit to Brassx for the picture. In order to use the marketplace, you must first register with a forum account on forerunnergaming.org. You should see a "Sign Up through Steam" button. Here, you can have all your guns up for sale through coins only at a set price, unless you decide to auction it. There is a sales fee past a certain price, and you'll also have to pay coins to list it if you're listing it excessively high. It'll automatically give you your coins as soon as another player purchases it - it doesn't instantly sell. You can enter the coinshop by going to your inventory, typing "!coin" in the chat, or just by simply hitting F3. Here, you can buy things from the server as opposed to directly from another player. Various crates will be for sale here, you can customize your character, you can purchase accessories, or you can store your accessories. There are two options of purchase: coins and rubies. Rubies are obtained through server donations. They will be displayed on the top left of your coinshop menu. You can not trade rubies, they're locked to your account - however, you can trade accessories purchased by them. It looks a little complicated, but once you get used to it, it's pretty simple. Where it says "Choose Item", you'll select your accessory. The "Choose Bone" option decides which bone your hat will move with when you stand or walk. As you go through the list, there will be a small ball indicating which bone is where on your character. The "Choose Sequence" option simply lets you pose to see how things look. That doesn't show in-game. The positions, angles, and scale are all self-explanatory, I suggest you play with them on your own. You can always reset them if you mess up. Before you exit, be sure to use the "Save All Changes" to make sure everything stays how you like it. If you take off an accessory and put it back on, it'll automatically go back to where it was previously placed. Be sure to go over the rules shown on the bottom right. Item Crates - The cheapest and most basic crate. Crescent Case - 500 coins, higher chance for better drops. Only crate that can drop the Ascultone. Crate of the Damned - No longer in the Coinshop, still droppable. Contains Halloween-themed items. RGB Presents - Green presents can be sold for rubies only in the Coinshop. Each color contains a unique godlike-tier accessory or weapon. You can obtain the "Jolly"-prefixed weapon through these only. 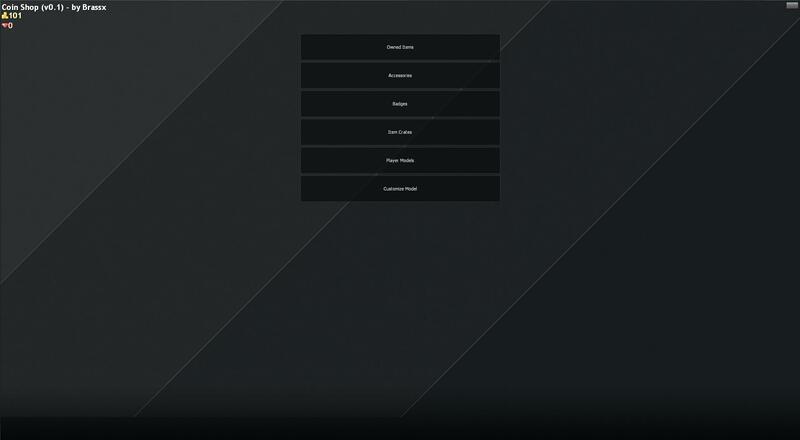 In your tab menu, there will be several sections. 9 to be exact. You can gain experience from rightful kills and being on the winning team, so play well! If you don't you could also lose experience. Your experience is shown on a yellow bar across the bottom of your screen, directly below your team/preparing/minigame bar. Every 5 levels, you will be awarded with a "Gift Crate". 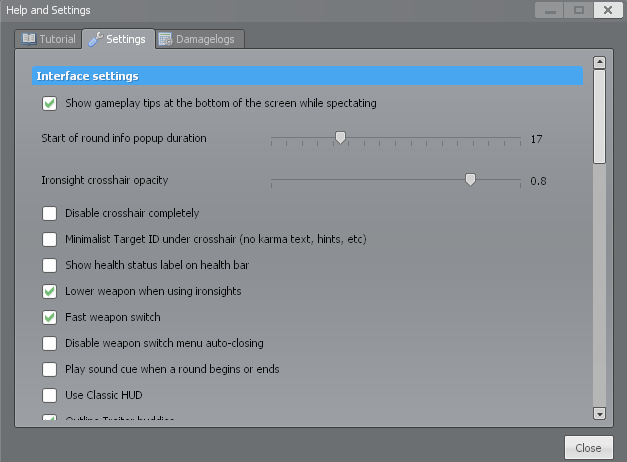 To enter the lobby, you must achieve level 10, which usually takes ~50 hours of play time. To enter, you type "!lobby" in chat. 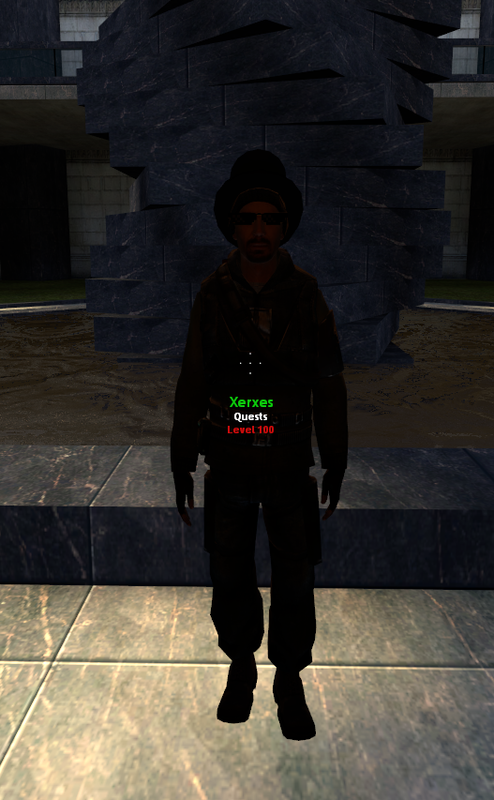 Here, you can talk to various NPC's and acquire quests or participate in events. Quests are given to you by an NPC named "Xerxes" and will task you with random assignments such as "Obtain 25 rightful kills without damaging a teammate" or "Get 3 rightful AWP kills". These will award you with forerunner fragments, which can be seen in your "!quest" menu. You can spend these fragments on 3 guns with an NPC named "Septimius" or for fully-charged crystals with "Chip Jewel". Both of these shops have a limited supply on each of what they carry and update weekly on Saturday at noon EST. Here, you can place bets against eachother and allow the rules that show on the bottom. Both parties can change them as they see fit, or they can use whatever their current loadout is. Once a duel is started, you will not get your items back unless the other party agrees to return them. All duels are logged. There are several arenas so several duels can commence at once. If you scroll down, you can also change a little more specific things like post-round music or disabling trades or even the font. If you're more of the "make-your-own" type, you can click F6 and it will allow you to resize, drag, and move anything on your screen to where you like it. It will display the current charge, your inventory (left) and what's going into the crystal (right). 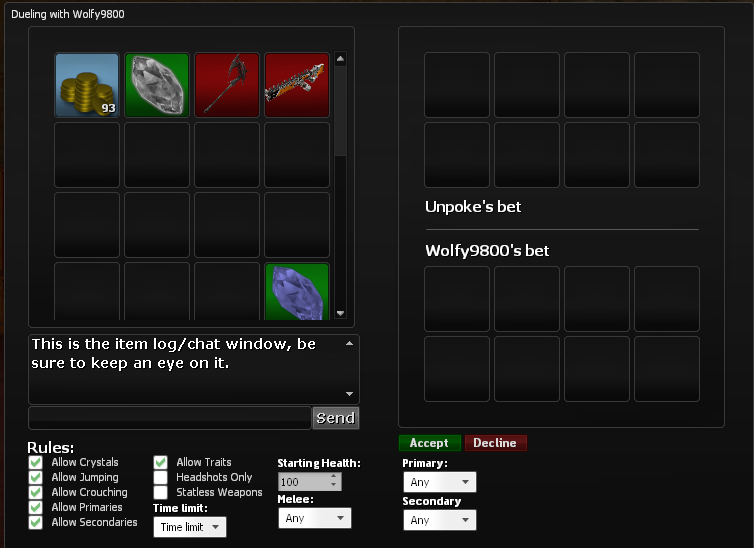 You'll notice several items in the displayed inventory have a red tint over them. 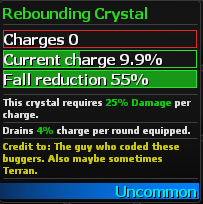 This means they do not have the correct positive stat to charge the shown crystal, and can not be used on it. WARNING: All guns used are gone FOREVER. 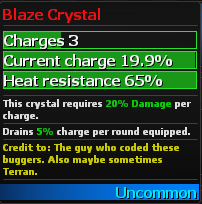 The Blaze Crystal requires a gun with positive damage stats to charge it, just like the Rebounding Crystal. It provides 65% heat reduction, which means fire and explosions will do 65% less damage to you. Each round depletes 5% of the crystal's charge. 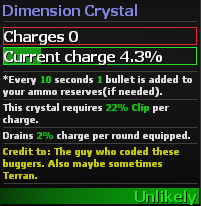 The Dimension Crystal requires a positive Clip (it will specifically say your clip in your guns stats if it has a change to it) to charge it. It adds a single bullet to your ammo reserves every 10 seconds until it's full. 2% is drained per use. 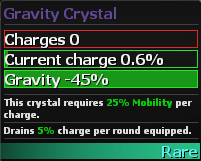 The Gravity Crystal requires positive mobility to charge it, just like the Jump Crystal. It reduces gravity's effect on you by 45%, making you able to have longer air-time, take less fall damage, and jump longer distances. This crystal drains 5% per round. 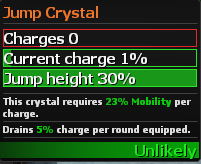 The Jump Crystal requires positive mobility to charge it, just like the Gravity Crystal. It increases your jump height by 30% allowing you to reach higher places around the map. It drains 5% per round. 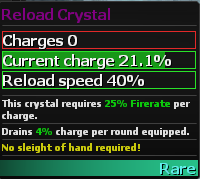 The Reload Crystal requires positive firerate to charge it. It increases your reload speed by 40% allowing you to replenish your ammo faster, giving you higher DPS (damage per second) and could help in close-situations. It drains 4% per round. 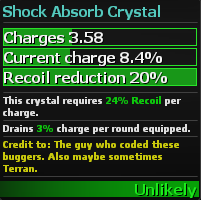 The Shock Absorb Crystal requires positive stability to charge it. It increases your guns stability which reduces the gun's spray in order to increase accuracy.It drains 3% per round used. 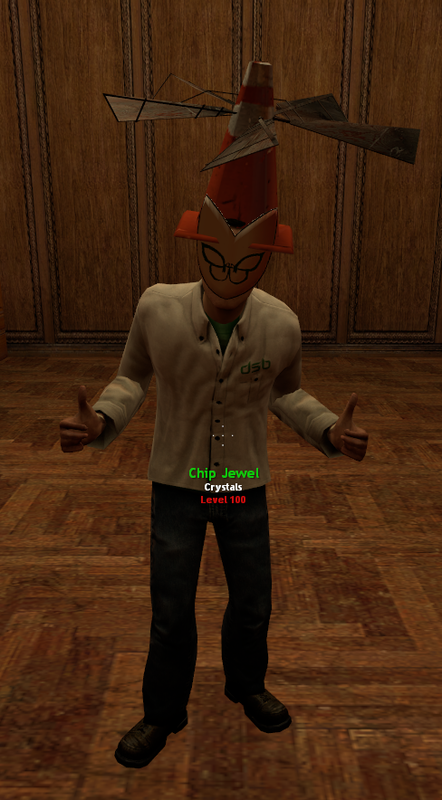 For more about crystals, you can read Brass' or Terran's guides. You could also visit Brass' complete guide. i.) Orbital Rounds: You must continuously run, or you may be hit by an Orbital Beam Cannon. The top 10 people that remain alive have a chance towards a prize, which typically will be gift crates, and the top 3 survivors have a guaranteed drop as well as a chance to a second drop. ii.) Snowball Rounds: You'll be given snowballs which 2-shot anybody. Get the most kills possible and stay alive as long as possible. Both contribute to what place you get in. Presents drop randomly, but the higher you are on the leaderboard, the better chance you'll get one. Beware of teams. It starts like an Orbital Round would, except in chat, there'll be a mention of snowball fighting. iii.) Dragon Rounds: Dragon rounds are by far the rarest minigame. They only have a chance to spawn in specific maps and will have giant text going across your screen saying "BOSS ROUND" or something of that sort. You can equip any gun you want, and that gun will have nearly infinite ammo - one person will be chosen randomly as the dragon. You will be awarded with mid-round bonuses depending on your damage (such as an AWP or other t-weapons), and your prize chance is dependent purely on your damage dealt. There are unique drops to these rounds - so far the only known one is the "Red Dragon Egg". 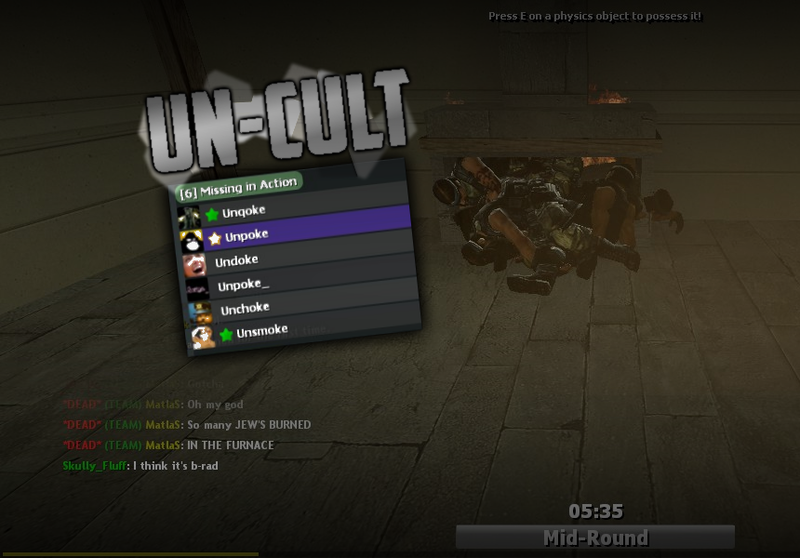 Events are acquired in the Lobby server. There are currently two active events: One from Santa who asks you to find 12 presents for him in return for an actual present and a 24-hour cool down (what a scammer) and one from Grim who will ask you to bring him 100 souls. 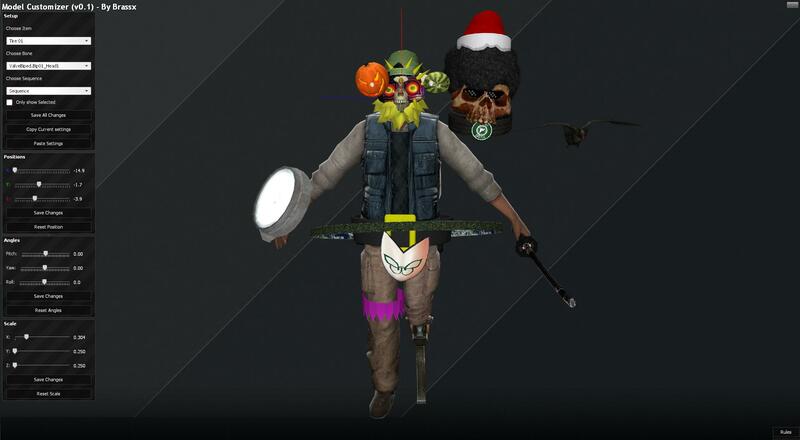 Both the presents and the souls will spawn on innocent rounds only. It will tell you in chat when they spawn, and it's your job to find them. Once you've acquired 100 souls for Grim's quest, you'll be able to form your own party (prior to it, you can join someone else's). Type "!party" and click create party, and type "!invite name" to invite people. You can go with a minimum of 4 people and a maximum of 6 people. There are unique drops within this "event", otherwise known as a "raid" or "Grim's Labyrinth". 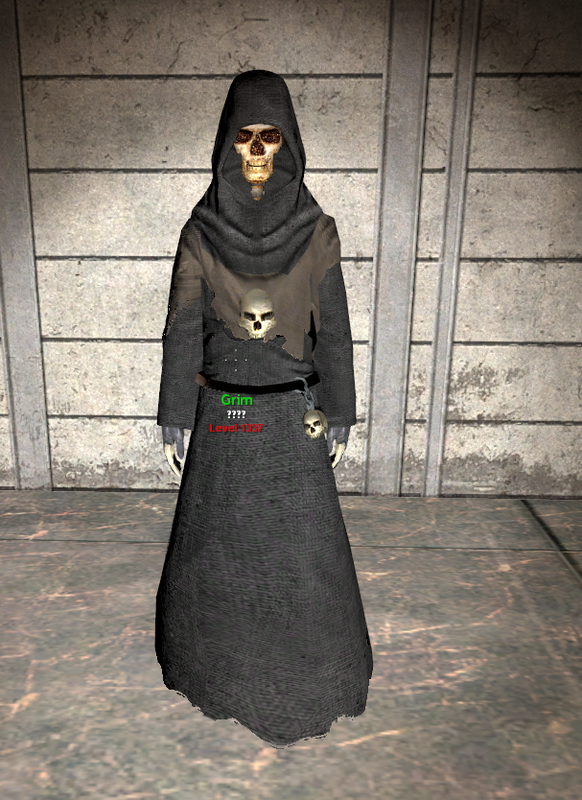 To check Grim's quest progress, type "!event". To check Santa's quest progress, type "!xmas". Q: How do you obtain coins or different guns? A: You can receive different items including coins by playing on the server. After each round passes, you have a chance of randomly dropping either of them. You could also use the marketplace or invest via trading. Surviving minigames and rolling crates could also help. Q: What is the order of rarities? A: Ordinary, Common, Uncommon, Unlikely, Rare, Legendary, Godlike, Exotic. You can't drop an exotic-tiered weapon, however. You get those by doing special things such as events. Q: What are suffixes and prefixes, and how can you get one? Can you make your own? A: Prefixes come from the Forerunner Package and were made by players for a $75 donation. Although they may come back one day, you currently cannot make your own prefix anymore. The suffixes are Phoenix, Corrosion, Contagion, Agony, and Damnation. Q: How do you report a player when no staff are on? A: Follow this format and post it in the Complaints subsection. Q: Why can't I log into the forums? A: Check to see if you have any abstract characters or symbols in your name. It could cause some sort of error. Also make sure you're using one of the standard browsers. If you still have problems, contact a staff member. More questions will be added. If you have any questions that you couldn't find here, post them below and somebody will answer them. I will add onto this post in time including a full guide on how to use the forums. How do I drop items? How can I get more guns? literally going to fight all of you. (12-30-2015, 09:39 PM)Unpoke Wrote: literally going to fight all of you.